Every year I anxiously wait for watermelon season to roll around. Watermelon is one of the few fruits I won’t buy out of season. I can’t risk it, I’ve been burned before. About eleven years ago, I bought a wedge of watermelon from the grocery store in October. I couldn’t help myself. I was pregnant, and that wedge looked so good with its deep red flesh and tiny white seeds. It was calling me, and I gave in. All I thought about on the way home was enjoying that tempting fruit in bed while I caught up on my judge shows. I put the wedge on a plate, grabbed a tablespoon and waddled upstairs to my sanctuary. (No cutting the watermelon off the rind for this girl.) My son was down for his nap, and I could enjoy my melon from heaven in peace. Needless to say, watermelon in October is nasty. It may look good, but it tastes horrible. It’s kinda like finally going out with that really cute guy from accounting, only to discover that he’s an incredibly bad kisser. You say to yourself, “But how can that be, when he looks so good?” Same goes for out-of-season watermelon. When I bit into the first chunk, a rage bubbled up inside of me that made me want to drive back to the store and shove the melon wedge in the produce guy’s face. I don’t know about other women, but when I was pregnant and got mad, I was like Bruce Banner trying to keep the Hulk at bay. Luckily, my son was asleep, and I was on modified bed rest and had no business driving to the grocery store in the first place, so the produce guy was safe. When Big Daddy found out about my trip to the grocery store, I lost my freedom. My two-year-old son narked me out—the little snitch. I was sentenced to daycare at my mom’s for the remainder of my pregnancy. While trapped on Nanny’s couch, I swore my revenge on the produce guy and vowed never to eat watermelon out of season again. Years later, I consume hundreds of pounds of watermelon from late-June to early-August. I pretty much eat watermelon for breakfast, lunch and dinner during the summer—as is, or whipped up in some recipe concoction. Watermelon salsa is one of my favorite ways to enjoy the king of summer fruits. It’s easy, refreshing and goes with anything. It’s also useful when you need to bribe your assistant to show you how to do the Instagram and not judge you. Unfortunately, I never got the chance to exact my revenge on the produce guy. By the time I gave birth and had the energy to return to the grocery store, the produce guy had graduated from college and moved away. Lucky for him. Combine watermelon, cucumber, mango, tomato, peppers, onion, lime zest, lime juice, honey, salt and pepper in a large mixing bowl until combined. Gently toss in cilantro. Refrigerate until ready to use. To make the tostada shells, lightly brush both sides of the corn tortillas with canola oil and place on two foil-lined baking sheets. Bake the tortillas for 5 minutes, then flip. Bake an additional 5 minutes until the tortillas are crispy, and light to medium golden brown. Remove the sheet from the oven, turn the tostada shells over and repeat the process. Toss the shrimp with lime juice and Tex-Mex spice blend to coat. Heat 2 tablespoons oil in a large skillet over medium-high heat. Until just pink, about 4 minutes. 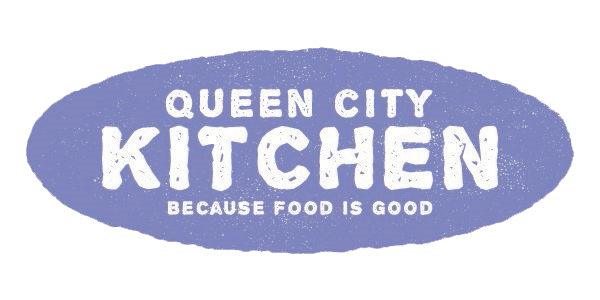 Do not overcook. 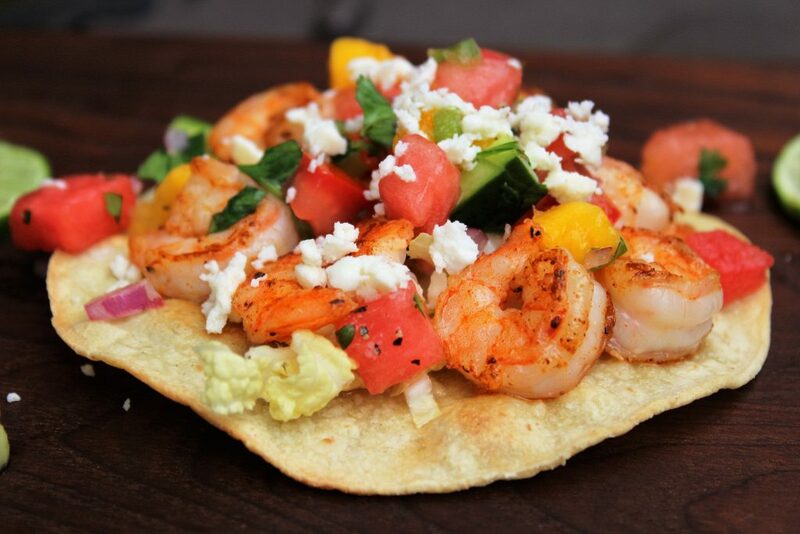 To assemble, top tortillas with cabbage, shrimp and salsa. Garnish with cilantro and serve. Buy Tex-Mex Spice Blend here. 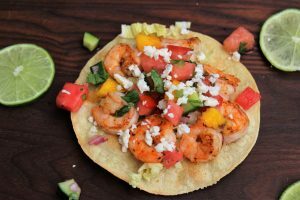 This entry was posted in Entree, Recipes, Seafood, Tex-Mex and tagged salsa, shrimp, tostadas, watermelon on July 5, 2016 by Andria Gaskins.